Today is general election day in the UK, and by this point it’s likely that whichever way your political leanings sway, you’re probably feeling pretty uneasy. 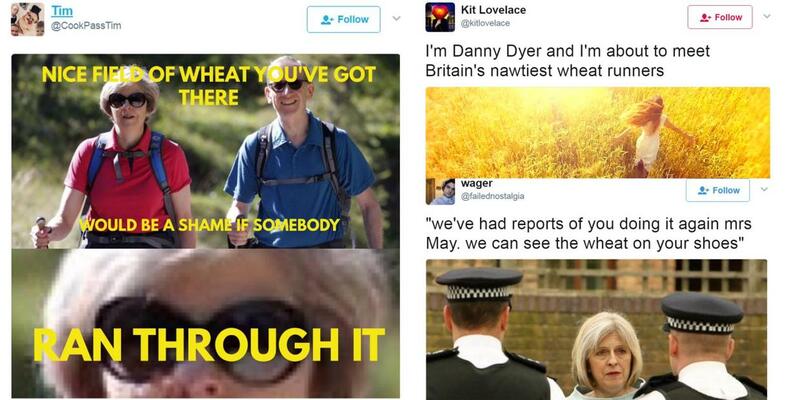 Frankly there’s been so much BS and nonsense and RUNNING THROUGH FIELDS OF WHEAT that it’s been exhausting trying to discover what’s going on outside of some very excellent memes. However the i newspaper promises that it stands “For a concise, quality election,” and is promoting that through a series of posters created by Atomic London, with each “lampooning one of the major political party leaders for recently announced policies, faux pas and political mishaps.” Media agency the7stars then worked on a tactical guerrilla strategy to flypost these around various sites in London. Create-Zine is a new publication aimed at those commissioning designers, art directors, illustrators, and photographers. Launched by two former Central Illustration Agency folks, Jules Beazley and Alicja McCarthy, the little mag boasts some ace work that also serves nicely as eye-candy for the non-commissioners, too. The indie title targets art buyers, creative directors, designers and publishers, and was designed by Luke Frost over at London’s Heretic Studio. “I am the champion, and you’re gonna hear me roar. Louder, louder than a lion.” Thus spake Katy Perry, as we were reminded with the news of a new look for LGBTQ nonprofit organization, Callen-Lorde’s annual fundraising event ROAR. Frankly any excuse to listen to KP in the name of research is great for us, but besides that this is a rather lovely project helmed by the good people at Mother Design. The studio was brought in to rebrand the June 1 event at the Central Park Zoo as a celebration to kick-off of NYC Pride, which helps “raise money to continue Callen-Lorde’s lifesaving mission to provide sensitive, quality healthcare and related services for NYC’s LGBTQ communities,” says Mother. Speaking of having the eye of the tiger (loose Katy Perry/Rocky/boxing connections here, keep up), Honolulu-born and New York-based artist Paul Pfeiffer is showing work at a new exhibition over at London’s Thomas Dane Gallery. Much of Pfeiffer’s work is themed around ideas of “the idol and the arena” which are explored through painstaking editing and manipulation of existing video and still imagery. “Pfeiffer’s innovative and singular practice unpicks the mythology of the ancient phenomenon of the stadium and the gaze of the crowd to reveal disturbing and unexpected aspects of these situations and human behaviour within them,” says the gallery. “Race, colonialism, conflict, graven effigies, celebrity and the quasi-religious experience of hero worship all feature prominently within the backdrop of popular sports culture.” Powerful stuff. Over here in the UK, 2017 marks 50 years since the passing of the Sexual Offences Act, 1967 which partially decriminalized male homosexuality in England and Wales. Hearteningly, many organizations have celebrated this fact through some fascinating exhibitions, like the National Trust’s recreation of raucous short-lived 1920s gay bar The Caravan Club, an excellent multimedia show at Manchester’s People’s History Museum, and now the British Library’s Gay UK: Love, Law and Liberty show. The exhibition features original manuscripts, posters, campaign materials, and sound recordings; providing an exploration of gay lives through personal testimonies, and legal reform, from the 1895 trial of Oscar Wilde to the controversial “Alan Turing law” and the posthumous pardoning of historical homosexual “offences” in 2017. Congratulations and house plants all round to the folk of D&AD, who’ve just moved into their swanky new east London premises designed by London-based agency Brinkworth. The two-storey, 8,000sqft space is housed in a restored Victorian building and features sliding glass doors “to allow the spaces to adapt to the wide range of activities,” according to D&AD. “As a charitable organisation the design needed to be modest and hardworking. The materials selected reflect this approach, using cork, plywood, steel, pegboard and painted white walls. The general feel is utilitarian yet still comfortable and welcoming. The one introduction of colour to the design is the signature bright yellow from the famous D&AD pencil awards. Hidden within the inside of the cupboards, a surprise flash of colour is revealed when opened.” Boo!